Background: Previous studies have shown that neurologic complications following carotid endarterectomy (CE) are underestimated if patients are not examined by neurologists after surgery. Objective: To review the morbidity and mortality in a cohort of patients examined before and after CE in a neurology and stroke clinic. Methods: This was a prospective case series from an academic medical center; 44 patients were referred for CE during the period June 1995 to April 1999. Mean age was 64.3 years; 70.5% were referred for symptomatic stenosis and 29.5% were asymptomatic. Three neurosurgeons and two vascular surgeons operated on the patients. Results: The 30-day mortality rate was 4.5% and the 30-day stroke or death rate was 11.4%. One patient had a TIA due to thrombus formation at the operative site and a second patient had an asymptomatic intimal flap. Conclusions: With prospective follow-up by neurologists, the CE complication rate in an academic medical center was significantly higher than the rates reported in controlled clinical trials. The generalizability of data from CE clinical trials is limited and local audits are necessary to better establish the risk/benefit ratio for individual hospitals and surgeons. To determine the risk/benefit ratio of CE, accurate documentation of perioperative complications, especially perioperative stroke, is important. A previous study found that the identification of perioperative strokes was lower if patients were not evaluated by neurologists postoperatively. Rothwell and Warlow4 reviewed 50 published studies and found that the postoperative stroke rate was 7.7% if patients were seen by a neurologist following surgery, but only 2.3% if a single surgeon reported his own results. We report on patients who were examined before and after surgery by neurologists in the stroke clinic of a university medical center. We hypothesized that the perioperative stroke rate would be higher than that observed in CE clinical trials. Patients were seen in the stroke clinic of a university medical center. All patients were seen by an attending stroke neurologist and many were also evaluated by stroke fellows and stroke research nurses. Many patients were participating in multicenter clinical trials of CE. Exclusion criteria for patients included 1) operation by neurosurgeons and vascular surgeons without preoperative evaluation by the stroke team; and 2) consultation by the stroke team for inpatient postoperative complications only. Patients were prospectively evaluated from June 1995 to April 1999. Demographic factors and medical history were recorded. We classified patients as symptomatic or asymptomatic. Occurrence of major and minor postoperative complications were noted; major complications included stroke and death. We classified strokes as major if they were fatal or if they were associated with persistent functional impairment (Rankin Scale score of >2 at 3 months). Minor complications included TIA and wound hematoma. We also noted the necessity for additional procedures (e.g., reoperation, stenting) within the first 3 months after surgery. Forty-four patients were seen before and after surgery during the time period of this study. Mean age was 64.3 years; 70.5% were symptomatic and 29.5% were asymptomatic. Three neurosurgeons and two vascular surgeons operated on the patients. These five surgeons performed approximately 70% of the CE procedures done at our medical center and during the time period of the study, each surgeon performed 10 to 50 CE operations per year. Select risk factors and demographic features of the patients are listed in table 1. Overall, 30-day mortality rate was 4.5% (2/44) and 30-day stroke and death rate was 11.4% (5/44). Three of the five strokes occurred in asymptomatic patients; two were fatal and a third was disabling, making the major stroke rate 6.4% and the minor stroke rate 5.0%. 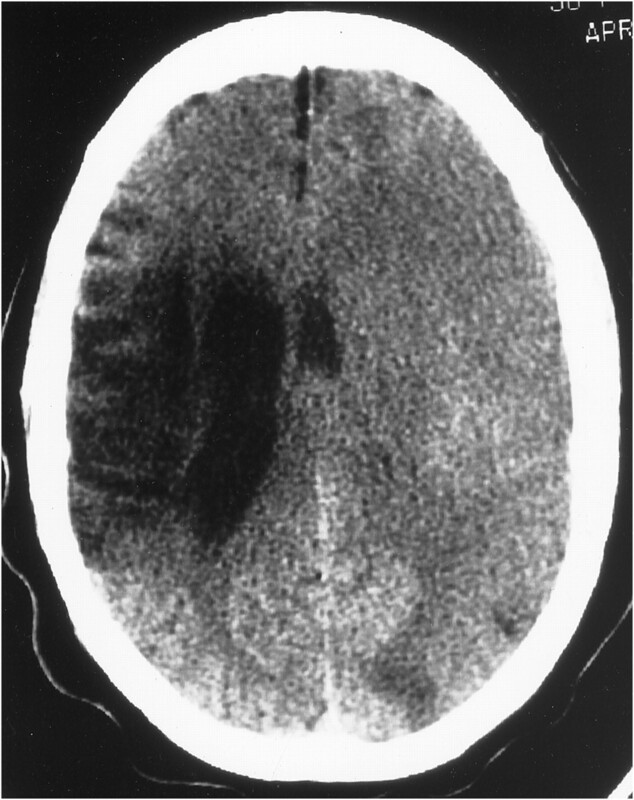 One of the fatal strokes and two of the three disabling or fatal strokes occurred in asymptomatic patients. During this time period, 440 CE procedures were performed at our medical center. The perioperative mortality rate in these cases was 1.7%. In the “high-risk” category, two patients had contralateral internal carotid occlusion and one patient underwent CE in combination with coronary artery bypass grafting (CABG). A 63-year-old woman with severe, symptomatic left internal carotid artery stenosis developed focal seizures on the first postoperative night. She had persisting right hemiparesis following surgery. Postoperative angiography showed an intimal flap. A 58-year-old woman with previous right hemispheric stroke and right internal carotid artery occlusion was referred for surgery for asymptomatic 70% left internal carotid artery stenosis. Following the induction of general anesthesia and the operation, the patient never regained consciousness. CT verified a large, left middle cerebral artery stroke (figure). She remained comatose and died a few weeks later. Figure. CT showing evidence of old right middle cerebral artery infarct, with a new left middle cerebral artery stroke following left carotid endarterectomy. A 71-year-old woman underwent combined CABG and right CE. Postoperatively, she was agitated. The neurology consult team diagnosed the patient with encephalopathy and did not correctly identify the new left occipital infarct and bilateral cerebellar infarcts. At 3 months after surgery, the patient had marked ataxia and right hemianopia and moved in with her daughter due to functional impairments. In this case, the stroke most likely resulted from the CABG procedure, because the postoperative infarcts were not in the territory of the operated-on carotid artery. Overall, four of the five postoperative strokes occurred in the territory of the operated-on vessel. One patient developed ipsilateral amaurosis fugax within 24 hours of right CE. Duplex examination revealed a thrombus at the operative site. He was taken back to the operating room and did well subsequently. Another patient had an asymptomatic intimal flap, discovered due to a persisting bruit following a right CE procedure. A postoperative angiogram showed the intimal flap, which was covered with a stent in an uneventful procedure. Therefore, two of 44 patients required a short-term procedure (either reexploration or stent placement) in addition to the strokes described above. One patient had a significant wound hematoma causing respiratory distress. The multicenter clinical trials of CE conducted during the past two decades have been a major scientific accomplishment. They applied hard numbers to a procedure that in the past was limited to either large case series or clinical trials from an earlier era. A critical element in applying these trials to the real world is whether the efficacy demonstrated in carefully controlled studies can be translated into real world effectiveness, because these studies typically evaluated CE in an ideal scenario of screened patients and screened surgeons. The overall stroke and death rate in NASCET was 6.5% and the major complication rate in ACAS was 2.6% (using intention-to-treat analysis).7,9⇓ In our study, approximately three fourths of the cohort was symptomatic. Therefore, if the clinical trials were completely generalizable, one would expect a complication rate of 5.5% in our cohort. That the observed complication rate (11.4%) was approximately twice as high makes it necessary to question the extent to which the results from CE clinical trials can be extrapolated to routine daily practice. The rate of major or disabling stroke noted in our study (6.4%) was similar to the rate (5.9%) compiled by surgeons in the recent Carotid and Vertebral Artery Transluminal Angioplasty Study (CAVATAS).12 The overall stroke and death rate noted in CAVATAS for the surgical arm was 10.9%, suggesting that our figure of 11.4% is consistent with other large clinical series in which neurologists are involved in patient evaluation. In attempting to explain the rather high complication rate in our series, other factors besides prospective evaluation by neurologists should be considered. For example, the proportion of symptomatic patients in our series (70.5%) was higher than that in most clinical series reported in the United States. In two recent studies, the proportion of asymptomatic patients was 47.5% to 70%.13,14⇓ In addition to the NASCET and ACAS trials, which demonstrated a higher complication rate for symptomatic patients, a systematic review by Rothwell et al.15 also found that symptomatic patients experience higher perioperative stroke risks. Finally, our study should be placed in context with other CE reports by neurologists over the last 25 years. In 1977, Easton and Sherman20 reported an alarming stroke and death rate of 21.1% in a series of CE operations from two community hospitals. In the 1980s, relatively high rates of perioperative mortality (2.3%) were noted in some medical centers.21 Our study reveals that despite the performance of several clinical trials, a new set of problems has emerged concerning CE use and performance. These problems include overzealous extrapolation from the clinical trials, disregard for high-risk patients, and failure to appreciate the narrow risk/benefit ratio for asymptomatic patients. Unless these problems are remedied, the value of CE as a stroke prevention measure in society will be greatly diminished. Neurologists should partner with surgeons to address these problems and improve the appropriateness of CE usage. Huber TS, Durance PW, Kazmers A, Jacobs LA. Effect of the Asymptomatic Carotid Atherosclerosis Study on carotid endarterectomy in Veterans Affairs medical centers. Arch Surg . 1997; 132: 1134–1139. Huber TS, Wheeler KG, Cuddeback JK, Dame DA, Flynn TC, Seeger JM. Effect of the Asymptomatic Carotid Atherosclerosis Study on carotid endarterectomy in Florida. Stroke . 1998; 29: 1099–1105. Tu JV, Hannan EC, Anderson GM, et al. The fall and rise of carotid endarterectomy in the United States and Canada. N Engl J Med . 1998; 339: 1441–1447. Rothwell P, Warlow C. Is self-audit reliable? Lancet . 1995; 346: 1623. North American Symptomatic Carotid Endarterectomy Trial Collaborators. Beneficial effect of carotid endarterectomy in symptomatic patients with high grade carotid stenosis. N Engl J Med . 1991; 325: 445–453. European Carotid Surgery Trialists’ Collaborative Group. MRC European Carotid Surgery Trial: interim results for symptomatic patients with severe (70-99%) or with mild (0-29%) carotid stenosis. Lancet . 1991; 337: 1235–1243. Executive Committee for the Asymptomatic Carotid Atherosclerosis Study. Endarterectomy for asymptomatic carotid stenosis. JAMA . 1995; 273: 1421–1428. Barnett HJM, Eliasziw M, Meldrum HE, Taylor DW. Do the facts and figures warrant a 10-fold increase in the performance of carotid endarterectomy on asymptomatic patients? Neurology . 1996; 46: 603–608. Ferguson GG, Eliasziw M, Barr HWK, et al., for the NASCET Collaborators. The North American Symptomatic Carotid Endarterectomy Trial. Surgical results in 1415 patients. Stroke . 1999; 30: 1751–1758. Hartmann A, Hupp T, Koch H, et al. Prospective study on the complication rate of carotid surgery. Cerebrovasc Dis . 1999; 9: 152–156. Taylor DW, Barnett HJM, Thorpe K, et al., for the ASA and Carotid Endarterectomy (ACE) Trial Collaborators. Low-dose and high-dose acetylsalicylic acid for patients undergoing carotid endarterectomy: a randomized controlled trial. Lancet . 1999; 353: 2179–2184. Brown MM, Pereira AC, McCabe DJH. Carotid and Vertebral Artery Transluminal Angioplasty Study: 3 year outcome data. Cerebrovasc Dis . 1999; 9 (suppl 1): 66.Abstract. Cebul RD, Snow RJ, Pine R, Hertzer NR, Norris DG. Indications, outcomes, and provider volumes for carotid endarterectomy. JAMA . 1998; 279: 1282–1287. Dandapani BK, Shah S, Gebel JM, Grove MK, Sesto ME, Parks P. Carotid endarterectomy in the elderly. J Stroke Cerebrovasc Dis . 1999; 8: 28–32. Rothwell PM, Slattery J, Warlow CP. A systematic comparison of the risks of stroke and death due to carotid endarterectomy for symptomatic and asymptomatic stenosis. Stroke . 1996; 27: 26–269. Oddone EZ, Horner HD, Sloane R, et al. Race, presenting signs and symptoms, use of carotid artery imaging, and appropriateness of carotid endarterectomy. Stroke . 1999; 30: 1350–1356. Chaturvedi S, St. Pierre E, Bertasio B. Attitudes of Canadian and U.S. neurologists regarding carotid endarterectomy for asymptomatic stenosis. Canadian J Neurol Sci . 2000; 27: 116–119. Chaturvedi S, Hachinski V. Does the neurologist add value to the carotid endarterectomy patient? Neurology . 1998; 50: 610–613. Brott TG, Labutta RJ, Kempczinski RF. Changing patterns in the practice of carotid endarterectomy in a large metropolitan area. JAMA . 1986; 255: 2609–2612.